I received the financial plan from the Vanguard advisor a week after I submitted the questionnaire. The plan was for my review before a 45-minute appointment with the advisor. As I understand it, the advisor would be able to make adjustments and create the final plan based on our conversation. The consolidated portfolio still took into account any tax consequences. In my case, it didn’t recommend selling any stock fund with unrealized gains. It also kept my muni bond fund. The funds chosen for the recommended portfolios were not surprising to me. They were all broadly diversified Vanguard index funds, as seen in Vanguard’s Target Retirement funds: Total Stock, Total International, Total Bond, and Total International Bond. The international stock fund was 30% of the total equity allocation. The international bond fund was 20% of the fixed income allocation. The plan devoted one page to the big-picture question — “Are you on track?” It ran the recommended portfolio and our estimated post-retirement spending through history. It then showed the success rate of meeting our retirement spending goal together with the best, average, and the worst cases. This section listed what to do in each account in order to move from the current portfolio to the recommended integrated portfolio or the consolidated portfolio. It was laid out clearly and easy to follow. The plan treated all accounts as one portfolio, as it should. It gave moves in each account, whether it’s a Vanguard account or not. The plan recommended only Vanguard funds, not even Vanguard ETFs in a Fidelity IRA account, let alone Fidelity Spartan index funds that are similar to Vanguard funds. You can substitute if you know how. It would be better if they can recommend at least Vanguard ETFs in non-Vanguard accounts in the integrated portfolio. Although it isn’t that difficult to look up the equivalent ETF of any Vanguard fund, it would be nice if they took that extra step for the customer or, in the true spirit of a fiduciary, recommended Fidelity Spartan index funds in Fidelity accounts. There’s one other quirk, which I added to the previous article about the questionnaire. By law Vanguard can’t give specific advice about a 401k plan if your plan has Vanguard funds as an option. It has something to do with conflict of interest. In such case Vanguard can only treat your 401k plan as cash and give you generic advice on asset classes. This limit only applies to employer plans, not to IRA or taxable accounts. If you want specific advice for your 401k account, don’t list Vanguard funds as current holdings or as available options in the questionnaire. Replace them with similar funds from a different company, say Fidelity. This section specified how we should invest our future savings. It was only listed in broad asset classes. It didn’t give a breakdown by account by fund. It would be better to have specific instructions for each account: put X% of your 401k contributions to this fund, Y% to that fund; put Z% of your IRA contribution in this fund, etc. I wrote down a list of questions for the consultation session with the advisor. Harry, I did this with Vanguard last year about this time. About six months later I became FI (few know what this is), I mean, got laid off (everyone knows what this is). While I understood the financial plan Vanguard completed at the time, I realistically could not execute to the plan due to the tax implication (selling stocks/funds during a year of significant income is a non-starter). Also, they recommended selling a “shareowners” company stock fund (ESOP) which I don’t think they really understood the track record (high teens over decades). But I will ask them to rerun a financial plan for me again soon. It is excellent to get another viewpoint on my financial plan at no cost. Did you speak with your Vangard Advisor yet? If so, what in general are your takeaways? Not yet. It’s coming up this week. I have been following personal financial stuff for a decade. I don’t really understanding this obsession about retirement, both from the mutual fund companies and the bloggers. Is this the life’s goal to retire and live off saving? I love my job and I intend to work as long as I can. I seems a lot of financial issues and risk will be much simplified if you just work longer rather shooting to retire at 60. I can only speak for myself. Work = do what others want you to do and get paid. Retire = do what you want to do. I want to work half a day each day and do something else the other half day, or come in two days a week and do something else the other three days. Unfortunately the job I do now doesn’t make it realistic to do so and I haven’t found a job that allows such flexibility and pays enough. So at the moment my only option is to retire. When did you retire? Would you do it all over again? I guess I’m lucky that my work is creative and challenging. I also want to do something else besides working for the profit of my company. I am doing some of this alone with my job, somewhat like you’re writing a blog while working. And I cannot do this in isolation. I need to connect with the people in the industry to do something useful. So I don’t see myself retire completely from the industry. Harry, you mention that the plan recommends only Vanguard mutual funds. This brings to mind a story. Sure, I can sign you up to be interviewed to develop a plan, but I see in your account that you own individual stocks. We don’t encourage that. You can expect that the plan will recommend owning only mutual funds. So I declined to proceed. Owning individual stocks probably isn’t for most people, but it has worked well for me, and I just don’t want an all-mutual-fund plan. But I can see how it would be good for a lot of people. Thank you for sharing. If you can get the plan at no cost because of your account size, I would encourage you to go through the process anyway. It’s not just the portfolio recommendations; you also establish a relationship with the advisor for other questions. The integrated portfolio tries to keep most of your current holdings and round it out with Vanguard mutual funds to keep your portfolio balanced and diversified. In my case because I have more in value and small cap stock funds, the integrated portfolio recommended adding growth and large cap stock funds. In the end it’s a recommendation. You are free to pick which changes you will make and which you won’t. Harry, so they recommended adding growth and large cap stock funds. I wonder what will they say if you tell them that the reason you have more in value and small cap stock funds is because you work for a large company. Are you going to ask them that? Also, did they say you can retire today? Haven’t talked to them yet. Will ask. 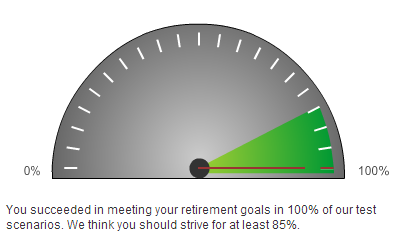 The retirement outlook tool says yes (see the meter at 100% mark) but I don’t quite trust it. Why don’t you trust it? Because it’s based on historical returns which were unusually high. Hi, Harry, correct me if I’m wrong, but when I read my Vanguard Plan, it seems it is not based on historical returns. Here’s the section on the report titled “Your Retirement Outlook”. Sam R – They are not using “averages” but past “patterns.” As I understand it, they say suppose you started with this portfolio in 19xx and you withdrew what you said, adjusted for inflation, for however many years, you would’ve ended up here. Then do the same for 19xx +1, 19xx + 2, etc. You get the worst, the average, and the best cases and the percentage of cases where you would’ve ended above zero. They are not making predictions for the future, but only replaying the past. It’s still historical returns. Harry, you mentioned that you’re not confident in Vanguard’s projections because they are based on historical performance. Do you happen to know if they use a “Monte Carlo” model or a simpler model that assumes a fixed return rate? Fidelity provides a do-it-yourself monte carlo retirement calculator that it calls RQC. First you enter your assets and specify your savings rate and your expected Social Security income. Then it runs at least 250 scenarios for your remaining lifetime. In each scenario it uses different random numbers to select performance for each year (this is the “monte carlo” feature). The annual performances in a scenario are chosen randomly from within a range of historical performances. You then get a prediction of your monthly income for the tenth percentile of all the scenarios, i.e., a prediction that the model believes to be a 90% probability that you will have at least that income. I think this so-called 90% probability scenario might be more satisfying for someone who is skeptical about future returns being as good as the historical ones. There are probably other monte-carlo retirement calculators out there, but this one is free (at least, it is free for me as a Fidelity customer), it has been offered for several years now. I’m hoping that it works right, but the only reason I have any confidence is that they at least provide a page with technical details about the methodology. Thank you @JohnG. I played with Fidelity’s more detailed Retirement Income Planner a little bit. It basically estimates a return for an asset class and gives it a range based on volatility. Then it randomizes the returns with Monte Carlo. P.S. Between the two I like Fidelity’s methodology better. Its baseline uses the 10-year Treasury yield plus a risk premium for stocks. When the 10-year Treasury yield is low, the baseline estimate for stocks is also low. Harry, does the Fidelity analysis tell u can retire today, also? (i.e. same like Vanguard?) Analysis report for me by an e*trade CFP and another one by a USAA CFP said “can retire in 2 yrs.”, but Fido said ‘in 3 yrs’. Ha! The Fidelity Retirement Income Planner has a lot more inputs. I haven’t spent enough time with it. I heard Fidelity reps at the local office can train you on how to use it to its full capacity. Maybe I will try that someday. It’s been a few years since I had a Vanguard financial plan done. I found it quite cookie cutter and nothing I couldn’t have put together myself. 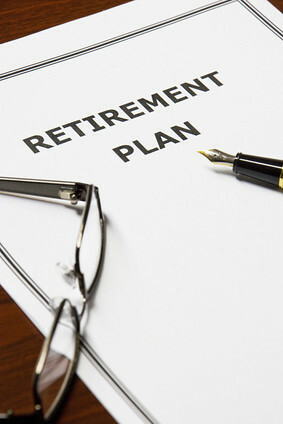 The planner was well informed but in addition to some of the things you discuss — lack of integration with 401K assiets, no ETFs, they can’t/don’t/didn’t discuss I-Bonds, TIPS, CDs or annuities, even SPIAs. No harm in doing it if it’s free but I cannot imagine paying for this. Nony – I think it depends on your current knowledge level and expectation. If I’m not around I would rather have my family get this than say the Fidelity or Schwab managed account options. A good point, I understand. In the last couple years one of the things I’ve done is track returns on Vanguard Life Strategy Conserv. Growth and Target Retirement 2010, the two portfolios which most resemble my financial advisor managed portfolio w/regard to equity/bond ratios, to make sure I’m getting my money’s worth from the advisor. I’ve consistently beat the returns on Vanguard funds despite having a smaller exposure to equities. However, it’s only around 1% more or less- (which easily still pays for my advisor fee plus a nice return) and I’d be quite comfortable advising my family to use either of these funds and would even feel comfortable doing it myself.